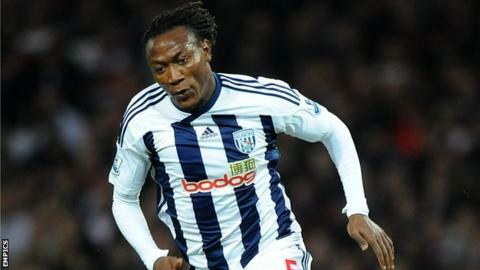 Former West Bromwich Albion striker Somen Tchoyi is on a list of potential targets for injury-hit Wolves. The 29-year-old was released by Albion in May and trained with Birmingham City in pre-season, and is now keeping fit with Wolves while he looks for a club. And his ability to play in wide areas could tick a box for Wolves boss Stale Solbakken, who has lost wingers Slawomir Peszko and Razak Boukari. "That makes us vulnerable in wide positions," Solbakken told BBC WM. "Boukari will be [out for] one month and Peszko three months, so we have to make sure that we have a little bit more to deal with them. "We have started making a phone call or two. But no-one has given us the right answer yet, so we have to keep continuing." Solbakken is also without Ireland international striker Kevin Doyle, whose thigh injury kept him out of Wolves' 1-0 win at Blackburn on Saturday. Doyle will also miss his country's two World Cup qualifiers this week. But Solbakken is "hopeful" that Doyle will be fit for third-placed Wolves' next Championship game at fellow high-fliers Huddersfield Town on 20 October. And the Wolves boss admitted he was happy following his side's win at Ewood Park, which was achieved despite the late withdrawal of reserve keeper Dorus De Vries and midfielder Dave Edwards, whose wives were both about to give birth. De Vries did not travel, allowing youngster Aaron McCarey his first outing on the bench, while Edwards' withdrawal came even later. "I was even prouder after all the things we had to contend with before the game," said Solbakken, "having to change it close to kick-off and having people play out of position. "But we deserved the victory. Our defensive display was close to perfect. Blackburn only had one chance. "If they had got the first goal the crowd would really have got behind them and maybe it would have been difficult for us. "But we had the best chances. And, as for Bakary Sako's goal, his left foot is out of this world. "That makes us dangerous at set pieces. His ability to find the target is very good."